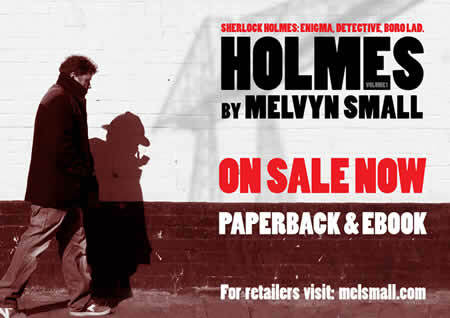 Holmes Volume 1 by Melvyn Small is now available in both ebook and (in some good bookshops) paperback. In an alternative reality the great detective Sherlock Holmes does not exist in the Victorian London of Sir Arthur Conan Doyle’s hero detective, but rather modern day Teesside. In this universe, Holmes with predilection for data, deduction and logic has a natural inclination to “ethically” hack computers that has, on occasion, caused him to drift on the wrong side of the law. On meeting Doctor John Watson, a psychotherapist he met during a series court-ordered rehabilitation programme, Holmes applies his talents to a series of cases in which Watson and he become embroiled. With Holmes and Watson still finding their feet as detectives, success is never guaranteed, however it’s always tantalisingly close and, with Holmes’ gin-dry wisecracks, invariably entertaining. The Holmes in these six short stories is in many ways an enigma. He dazzles with his observation and logic, but alludes to some sort of trickery. He appears absent and withdrawn to the point of being a sociopath, and yet he seems to possess an uncanny understanding of the human condition. His approach is sometimes harsh and violent, although he is prone to acts of great selflessness. Even his language, his harsh profanity-ridden vernacular and unrelenting sarcasm, may serve only to mask the true man. Perhaps the real mystery here is Holmes himself, with his variable character, self-efficacy and mockery creating an undercurrent of doubt for both Watson and the reader as to the provenance of this strange creature. Download an ebook from Amazon Kindle, Smashwords.com or Apple iBooks.